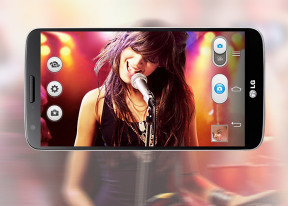 The LG G2 is a solidly built smartphone with a practical design and innovative placement of the hardware controls. It has good looks, though its rear pattern is quite similar to its major rival - the Galaxy S4. One-hand operation with the device is surprisingly possible thanks to the key on the back and the one-hand keyboards LG has provided. Pocketing isn't a problem either, the LG G2 has its slim profile that will fit in almost any pocket or purse. The eye-catching 5.2" True HD IPS Plus display of Full HD resolution is definitely one of the LG G2's key selling points. LG is keen on making lots of noise about how the colors are rendered, pitting it against Samsung's AMOLED displays. 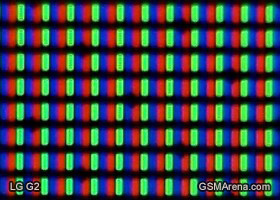 Long story short, LG claims the G2's display shows 100% accurate colors, unlike AMOLED screens. Of course, we took it for a test drive ourselves and we can safely confirm that the images indeed look great and colors pop, especially the reds. The display is impressively sharp too, thanks to the amazing pixel density of 424ppi. So, the screen junkies that we are, we decided to take out the Galaxy S4 and put its Super AMOLED 1080p screen next to the True HD-IPS+ 1080p LCD of the G2. The direct comparison showed that the Galaxy S4 has better contrast and juicy, oversaturated colors (which is plus or a minus, depending on who you ask). LG has done great in minimizing the screen's overall reflectiveness and we are glad to share that unlike the Optimus G Pro, the G2 True HD IPS Plus display is quite unreflective when it's on. There is some contrast loss when you are viewing the screen at an angle, but it's minor and won't take away from the otherwise great picture quality. We also compared the G2 screen to the Optimus G Pro's, which theoretically uses the same technology. The Optimus G Pro's screen has about the same level of contrast, but it is a bit more reflective and as a result its sunlight legibility is worse. LG will be also offering the cool QuickWindow flip covers, but unlike the Galaxy S4 S Cover, those will wrap around the back instead of replacing it. This is because the LG G2 uses unibody construction and you can't really remove the back cover. As the name suggests, QuickWindow covers feature a small windows that the G2 nicely utilizes turning it in a "mini phone" within the bigger phone. You can make calls, use the music player, read your messages, check the notifications, all without having to open the cover. LG has also pre-bundled lots of fancy clock skins.